The 5th Annual IGA Kendo Club Gasshuku was held last Oct 3-4, 2015, in the Saint Marie Eugenie Sports Complex of Assumption College Antipolo, Antipolo City, Rizal, Philippines. I was especially excited (and also dreading) this year’s edition, because the scope of was definitely more national, as almost half of the participants came from other clubs from other regions of the Philippines. Around 116 delegates total came, from the different clubs in the Philippines. Finally we had visitors from the Manila Kendo Club who joined the godo keiko on the 2nd day of the event. Training was led by the senior members of the IGA Kendo Club, namely Igarashi-Sensei, Sakuhara-Sensei, Nakagane-Senpai, myself, Loida, and Alain (this in spite of suffering a bad injury just prior to Gasshuku, so we salute you Alain). Gasshuku Day 1 started with the opening ceremonies, warm-ups, a kata seminar, and shiai seminar. But the real challenge for day 1 started after lunch, with Igarashi-Sensei’s infamous Suburi Challenge. This year, the target was 2500. Start of Suburi Challenge with Igarashi-Sensei and Ilaya-chan leading the way. Delegates formed their “suburi teams”, each in charge of counting out 100 at a time. Near the beginning, delegates are still energetic. But as time went on, the effects of doing multiple suburi started to take its toll. Pain started to set in. And in the end, we pulled through and finished!!! 2500 (plus some 100 or 200 extra) suburi were finished by the group, leaving them aching and exhausted. However, the day was not finished yet as there was still 2 hours worth of waza-geiko and jigeiko to do. The day ended with a giving of certificates of participation to all the delegates. And finally we could go to the hotel and rest…or so we thought. Because between dinner and post dinner activities, most of us crawled into bed midnight or after. Par for the course for a Kendo event I suppose. The second day of the Gasshuku was dedicated to the various shiai events. 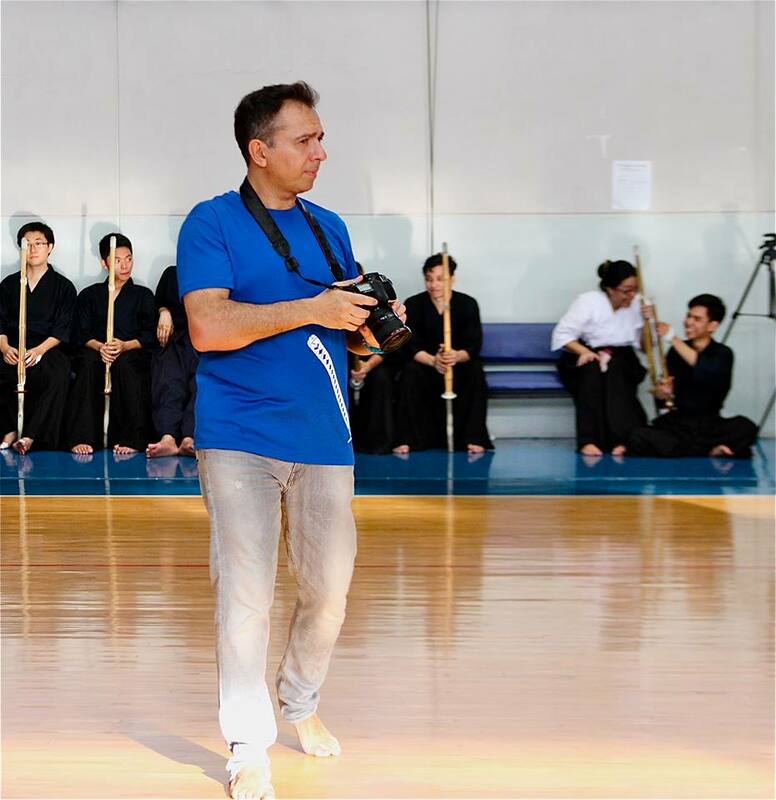 The first event was a “surprise shiai” for the No-Bogu Class members. All of the delegates who were currently in their club’s No-Bogu Classes were divided into two teams, and were given the chance to participate in their first official shiai. After some “interesting” matches, the Red team came away with the win. The second event of the day was the Mudansha Team Shiai. This was the most interesting one for me personally, as each dojo fielded a number of 5-man teams to represent their respective club in competition. In a sense, this was kind of laying down the ground work for an eventual Philippine national shiai. The 12 participating teams were divided into 4 groups of three teams each. The teams topping each group would then face each other in the semifinals, with the final two facing each other in the finals. After the eliminations, we had Team G-Force from the Arena Fitness Dojo face off against Team Ceasar’s Salad from the Dasma Village Dojo (plus 1 City Club) in Court A, while Team Super Heroes in Training from the Dasma Village Dojo faced off against Team Walang Forever from the Iloilo Kendo Club. G-Force and Walang Forever won their respective matches, setting up a North vs. South match for the Finals. In the Finals, G-Force took an early lead as Sison beat Beatingo 2-0, and Mizusaki beat Osumo 2-0. The chuken match came, with added pressure on Yoro to win against Sebastian in order to keep Walang Forever’s hopes alive. Unfortunately for them however, Sebastian also took the match 2-0. With the winner already decided, the fukusho and taisho of Walang Forever went for broke, with Figueroa winning 2-0 against Soliman, and Gomez also winning 2-0 against Galura, thus salvaging somewhat their campaign against the G-Force Team. Joint 3rd Place was awarded to Teams Super Heroes in Training (left side on the picture below) and Ceasar’s Salad (right side). 2nd place was awarded to Team Walang Forever. And finally, Team G-Force was declared the Mudansha Team Champion. The final event of the day was the much anticipated Yudansha Individual Shiai. Featuring 16 participants from the various IGA-Ken Dojo, and 1 participant from Davao Kendo Club, this was projected to be an exciting competition. Early favorites to win were Sakuhara-Sensei and Nakagane-San, but some of the other members like Sugawara and Reyes were expected to give them a hard time reaching the finals. The first round ended with some unexpected results, including the early exit of Reyes who fought against Abriol-Santos (Dardsie). Another surprising first round exit was Espiritu, who went up against Yaptinchay. Inspired performances were put in by other players however. One was from Mallari (from UP Ken), who beat Matsuda (from Davao) in order to set up a match with Sakuhara-Sensei in the semifinals. Also, Pio de Roda put in a solid match against Yaptinchay to put himself in the semis against Nakagane-San. In the semis however, tournament favorites Sakuhara-Sensei and Nakagane-San were not to be denied, and they won their respective matches against Mallari and Pio de Roda, setting up a Finals showdown between them. And what a Finals it was. The match started with Nakagane-San going into jodan, which was a bit surprising because up til then he had fought using chudan. This proved to be the x-factor however, as he scored the initial ippon of the match on men-uchi. Nakagane-San going into jodan mode, much to the delight of the spectators. Sakuhara-Sensei rallied back however, and managed to score a kote-ippon on Nakagane-San’s hidari kote. Regulation time ended with the two of them tied, so the match went into encho. In encho, Sakuhara-Sensei pulled off an almost impossible-seeming kote ippon on Nakagane-San’s migi kote while he was still in jodan, thus winning the match and the championship. The day ended with one last jigieko. Then it was truly over. For more pictures, go to this gallery. This past weekend has left us with aching and sore bodies, but with an invigorated spirit to continue our respective Kendo journeys. It’s more than just the training I guess. In a very real sense, this particular Gasshuku has reinforced the sense of community among Philippine kendoka. Helping to organize this Gasshuku has been stressful of course, but the end result has given me a sense of fulfillment that I will take with me when I go back to training in my dojo. Finally, I would like to express my thanks to various people who made this Gasshuku successful. To the committee members, Verns, Johnny, Alain, Allan Lim, Ejay, Gek, Jun, & Tony, thanks for helping me out. I couldn’t ask for a better set of organizers. To the members of IGA Ken, Davao, Iloilo and MKC, thank you for spending time with us during this Gasshuku. This is for you after all, and your cooperation helped it become a success. To the emergency responders on the last day, thank you helping to make a bad situation not so bad. Dylan, thank you for giving us the opportunity to test our emergency response skills…but don’t do it again! To Igarashi-Sensei and Junko-San, the two of you continue to serve as an inspiration to us all. May you continue to inspire us with your teaching and demeanor, both in and out of the dojo. And finally, thank you to my partner in crime, Loida. You are my rock in this crazy world, and my continuing inspiration to do my best as a kendoka and as a leader. Thank you once again everyone, and see you next year! This entry was posted in Competition, Events, General Kendo News, Kendo, Socials, Stories / Testimonials and tagged Arena Fitness Dojo, Assumption Antipolo, City Club Dojo, competition, Dasma Dojo, Davao Kendo Club, Iga ken, Iga Kendo, IGA Kendo Club, Iloilo Kendo Club, kendo, Philippine Kendo, Philippines, shiai, tournament, UP Kendo Club. Bookmark the permalink.